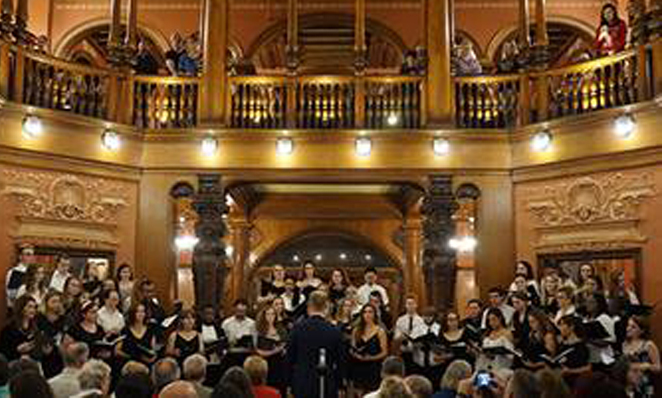 SAINT AUGUSTINE – The Flagler College winter concert will take place on Monday, Nov. 19 at 7 p.m. in the Rotunda of the college’s Ponce de Leon Hall, 74 King St. The performance will include an eclectic mix of holiday music, both sacred and secular. The concert will feature the college’s Chorale, a non-auditioned group of singers from a variety of majors and backgrounds, combined with the audition-only Chamber Choir. This year marks the third annual performance for the vocal groups. “It’s a nice send-off before Thanksgiving to help establish the mood of the season: one of joy and sharing,” said musical theatre Assistant Professor Kip Taisey. Admission is free, and the event also qualifies as a co-curricular event for students. For more information on the Flagler College winter concert or the Flagler College Department of Theatre Arts, please contact Kip Taisey at (904) 819-6217 or ktaisey@flagler.edu. To visit Flagler Theatre productions, go to http://www.flagler.edu/theatre.